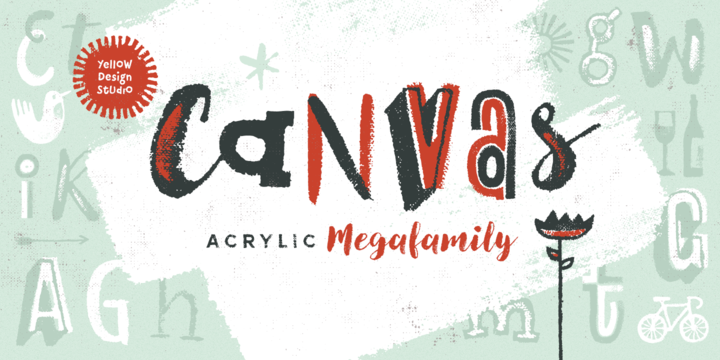 Canvas Acrylic is a huge collection of script fonts designed by Ryan Martinson, Rena Martinson and published by Yellow Design Studio, a graphic design studio from Sanibel, Florida (USA). Featuring nine distinct hand-painted font families ranging from refreshing acrylic brushes to organic letter forms and truly original icons sets, Canvas Acrylic include unique layering options that gives it dimension and impact anywhere. Did we mention this family is huge and has 9 sub-families for a 39 fonts in total. Get true acrylic textures with Canvas Acrylic Megafamily! A font description published on Tuesday, March 29th, 2016 in Fonts, Rena Martinson, Ryan Martinson, Yellow Design Studio by Andrei that has 3,319 views.